Definition: Trade Publishing is a book industry term that refers to the business of publishing books for a general audience. Trade publishing encompasses most of what the consumer thinks of when he or she thinks of "book publishing." "Trade books" are the ones most people think of when they think of books and publishing. They are what's stocked in most common bricks-and-mortar retail bookstores, the "best-sellers" on online booksellers, and the volumes found in public lending libraries. Ebooks and audiobooks are considered part of the trade book market - they are different formats of trade books. So, trade books are the books that the consumer is most likely to be reading in print or on their device — or listening to — on their commutes. Trade books are, of course, available through online booksellers such as bn.com and amazon.com as well, but these retailers do also carry non-trade books, as well ("So What is Not A Trade Book," below). 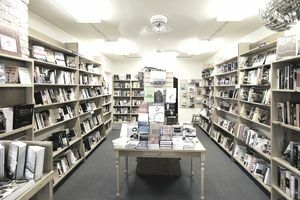 Technically, hybrid publishers and self-publishing services produce books for the trade marketplace, though there are some challenges getting these books to the consumer. Note that with consolidation, many "name" publishers across the globe house trade publishing divisions along with other types of publishers. These include Houghton Mifflin Harcourt, where trade books represent 12% of their business, and Palgrave Macmillan, and many more. So What Is Not A Trade Book? Academic Books, Including School Books and Textbooks - Books that grade school and high school students use for classroom learning or that college students are required to read for their coursework are not trade books. These are textbooks, designed specifically with learning in mind. Textbooks are written by or with the input of teachers and professors. School books for the classroom are often purchased in bulk for use by entire school systems. For example, a third-grade history text might be used system-wide. Note that some books from trade publishers are "adopted" as mandatory reading for certain schoolroom or college subjects. For example, the trade novel Huckleberry Finn is often sold to schools to be read in English classes, and college courses often require non-textbook trade books as part of their syllabi. In these cases, the books are sold by trade publishers through sales reps and channels that cater to these specific school and academic sales channels. Professional, Technical & Reference Books - Highly specialized books used by practitioners in fields such as accounting, medicine, psychology, computer science, architecture, etc. come from "professional publishers" that specialize in those areas. These are very authoritative and can include in-depth books on very niche areas within the subject matter or general reference materials. Because of the small and distinct audiences for a trade book, and the cost of authoritative content, professional, technical and reference books cost substantially more than a trade book for the average reader. For example, Architectural Graphic Standards costs $250 in hardcover or annual or monthly digital subscriptions for $139 and $14.95, respectively.